Anne Boleyn Questions – Just how serious was Henry VIII’s 1536 jousting accident? 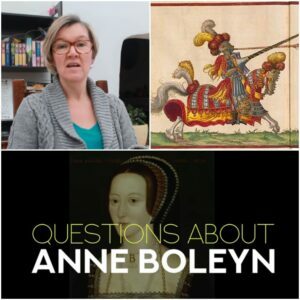 As you know, I’ve been doing a daily “on this day in Tudor history” video for the Anne Boleyn Files and Tudor Society YouTube Channel and today’s video also fits into my “Anne Boleyn Questions” series because it is about Henry VIII’s 1536 jousting accident. I’m often asked about this accident and its impact on Henry VIII’s health and behaviour. Was it serious? Did he suffer a brain injury? Did he undergo a personality change after it? Could it have been a factor in Anne Boleyn’s fall just four months later? In this video, I look at what the contemporary sources say about this accident and share my own opinion on the accident’s impact. I’d love to know what you think too, so please do leave comments here or on the video on YouTube. de Carles, Lancelot, “Poème sur la Mort d’Anne Boleyn”, in La Grande Bretagne devant L’Opinion Française depuis la Guerre de Cent Ans jusqu’a la Fin du XVI Siècle, Georges Ascoli. « Anne Boleyn Questions – Did Henry VIII love Anne Boleyn? Hi Claire. I just watched the video. Your conclusion makes perfect sense. In addition to the examples you gave of Henry’s previous acts of brutality there is also his executions of Empson and Dudley soon after he took the throne. They had only been doing the bidding of Henry’s father. There is a documentary that you can find on YouTube called ‘inside the Body of Henry Viii’. It’s hosted by Lucy Worseley, Robert Hutchinson and Catherine Hood. It discusses many of the medical problems Henry had. Though their conclusion on the accident of 1536 may be incorrect their descriptions of the forces on Henry’s body are pretty thorough. I saw that video as well Michael it was very interesting, there was the theory he had type 11 diabetes which very overweight people can get, however my friends son recently developed diabetes and he was only sixteen fit and nor overweight, his family were devastated but he copes very well and there is no diabetes present in his parents or their parents either, so his condition remains a mystery, people who suffer from diabetes can develop glaucoma which can lead to sight problems so Henry could have experienced a slight loss of vision to. As you know I am diabetic (type2). No history in my family. My younger brother is also diabetic, his caused by alcohol abuse. If Henry were diabetic, which I believe he was (unhealing ulcerous leg) it could have manifested from other internal medical problems he may have suffered from. Yes I remember you said about your diabetes before, I hope you are coping well it’s very sad about your brother, I hope he’s managed to stop drinking, Henry used to drink copious amounts of wine sweetened with sugar and then of course the huge amounts of meat and pies he ate, what he needed was his doctors to tell him to cut down his food and wine intake but how could you tell Henry V111 he was a bit of a porker? I’ve never seen the connection between this accident and his egotistical, monstrous behaviour. As you say, he had already turned on his loyal wife of twenty years because he lusted after Anne, telling himself it was God’s will. He had already brought down Cardinal Wolsey because he couldn’t do the impossible for him, he had murdered Thomas More, a totally innocent and rare good man. I believe he lusted after Anne, that she fought him off for years hoping he’d give up and go away. He refused her marriage to Henry Percy, whom she loved, so why should she ever forgive him for that? He was a spoilt child who couldn’t bear to be refused anything and his treatment of all his wives was disgraceful. Jane would have fallen the same way had she lived. Very interesting about the sources dor this incident. Thank you! I’ve never believed Henry became a tyrant overnight. I think his wish to marry Jane Seymour was the trigger for the fall of Anne Boleyn, and he had executed many people without much justification from the start (which was probably also quite normal for the times): Empson & Dudley, Edmund de la Pole, even the Duke of Buckingham. I think Henrys fall was just a tumble and he was possibly bruised and a bit shaken, it all depends on how fast the horse was going, jousting was the sport of Kings and no one could advise Henry not to partake, not even his doctors but really looking back we can see how foolhardy it was for a king who had worries about his succession, and whose wife was pregnant to indulge in it in the first place, but it was accepted at the time and Henry had jousted since his youth, however he was by now getting pretty hefty and his responses were slower, although he must still have cut a fine figure of a man on his horse, I believe Eustace Chapyuis account after all he was present at court and as Claire says, he had a number of reliable sources, Henry must have thought and others with him that no danger had taken place but had it? There was the near fatal accident that had taken place years before and knocks to the head are dangerous, Muhammad Ali in the 70’s was in his heyday and yet years later he suffered from the condition known as ‘punch drunk,’ a film of him taken when he was much older showed a sad figure of a man, his head was shaking uncontrollably and it was tragic to see, doctors have campaigned for years to get this sport banned, jousting throughout the medieval and Tudor period was a skilled sport and all nobleman as well as royalty took part but it was like boxing very dangerous to the men and horses too, who could be injured quite badly, Henrys accident was said to have caused Anne extreme distress so that she miscarried and one can imagine the anxiety she felt when informed, her uncle burst in on her and without much delicacy told her the King had suffered an accident, no doubt he was shocked himself and his first thought must have been for his neice even though he often clashed with her, it was tragic but had Norfolk not told her rather clumsily about the King’s accident Anne may well have not suffered a miscarriage, given her condition one would expect Norfolk to have been more tactful, it is rather difficult to equate Henrys injuries with his acts of tyranny later on in his reign, as the video says, and as Michael comments there was the executions of Epsom and Dudley the infamous tax gatherers at the beginning of Henrys reign, these were said to be merely an act of appeasement for his subjects who had suffered under them, but as Micheal rightly says, they were only carrying out his father’s orders, they were scapegoats nothing more, but Henry was friendly cheerful and nothing like the tyrant he later became, those two executions we can safely say were done to curry favour with the people, completely different from the bloody executions of Lady Pole, the deaths of More Fishor the Carthusian monks all mentioned by Claire, then he seemed to persue their deaths with a vengeance certainly over Lady Pole his own cousin he expressed no regret, he did with More however so there was still a vestige of the old Henry there somewhere, had this King remembered to lower his visor that fatal day when Brandon jousted against him, those bloody deaths may not have occurred, had that happened today Henry may well have had a brain scan, injuries when occurred can come out years later, dysentery can lie low in the body for many years then flare up, head injuries are more subtle he may have thought he was alright, but sinister changes may have begun to take place in his mind that was responsible for his feelings of persecution in later life and for the brutal deaths of his second wife and her so called lovers, he even turned against Cromwell who had helped him in getting rid of her, but I believe his increasing bad temper was also due to the disappointment’s in his life to, possibly excarberated by his head injuries, when young he was idealistic he was hopeful and optimistic as the young are, then ‘life’ happens, no one ever said life has to be fair, and this King was very unfortunate in that that he could not have healthy sons, then his first queens stubbornness against his quest for a divorce/, annullment, Annes continued nagging and his daughters siding with her mother, for years he must have felt he was up against a wall of such huge dimensions and it was all for a son, then finally he and Anne were married and she had a daughter, that was the first blow and then she lost one baby and then her final one after Henrys last accident, no wonder he was bitter and twisted, he must have felt life had given him a raw deal, he executed the young Earl of Surrey and his fifth queen along with Lady Rochford when really she should have been just imprisoned, here we can see Henrys reasoning was pretty sour as she was only following the queens orders, but he was in no mood to offer leniency, the tyranny of Henry V111 is interesting to speculate and we can assume his ill health made him a lot worse, he sank into a depression and over ate and drank, it was noted he lost weight when he was married to his fifth queen, then as what can happen with grief, food became his comfort and he grew very obese, thus rendering him more immobile, his legs were black with open weeping ulcers and the pain must have been great, the blinding headaches he suffered from could well have been migraines caused no doubt by the blows he had suffered, no wonder he was bad tempered and morose, anyone whose had to put up with a cranky old person can understand, his descent from a sunny natured handsome athletic golden prince into that of an obese crippled tyrannical old King was tragic, equally tragic were those who suffered because of their closeness to him. A very good clarification – or should I say “claireification? – from you. I very much agree. The accident didn’t change Henry, but it might have stripped off some of his “nice” facade and shown his true self more clearly. Oh dear sorry I thought you were addressing me my apologies. “Claireification” made me chuckle, thank you! I am doing very well Christine, thank you for asking. My brother? Wow, I am so proud of him. He quit cold turkey, lost weight, is in shape and March will be 2 1/2yrs dry. I don’t know how he did it but yay! That’s great worthy of another yay! The fall was more than a tumble. A jousting horse could go between 35 and 45 miles an hour and was a warhorse in full armour, the equivalent of a tank. Henry was 6 foot 2,_probably allowing for shrinking, he was 45 but still powerfully built, again in full armour. Two galloping tanks, crash, bang, wallop, you fall to the ground with one hell of a bash. The horse more than likely fell on him or rolled on him, mine almost rolled on me but not wearing armour, I could get out of the way. Even without being out for two hours, the fall and impact, which involved his head and body hitting the ground at speed, involved a powerful impact, his brain being rattled around and some form of head injury. Henry’s personality was noticeable in the changes afterwards. Even if other factors are taken into consideration, the long years of the annulment, the Supremacy and suddenly realizing the extent of his power, the after effects of the near fatal injury in 1524, when Suffolk almost minced his brains on his lance, there is no doubt that this one changed him beyond recognition. Whether it brought out more of the negative or changed him completely is still highly debatable, as is how much damage was done as the sources disagree. In a politically sensitive atmosphere, probably it would not be wise to note that Henry was unconscious for two hours, so maybe it wasn’t widely known. It was certainly Anne’s excuse for her miscarriage so she was badly frightened by the whole experience, which suggests that Henry was hurt and was of concern. We know there were signs Henry was changing before his accident, but we also know that afterwards everything became more extreme, more unpredictable and he became much more paranoid and given to mood swings. This accident put paid to his jousting, many of his other physical activities were restricted as a result of other old injuries, the treatment for his ulcers contained lead, which is toxic, the ulcers caused him a lot of pain and his eating increased. His depression also became manifest and he began to have erectile dysfunction, which today we know is not uncommon among men over 45. This for Henry would have been a disaster given he had to be manly at all times. Sexual dominance was important. He had suffered from migraine for years and these got worse. He lacked heirs, he was immobile at times for long periods and in pain. Out for the count or not this accident marks to much of a turning point to be dismissed, especially by people who are not neurologists or who have never fallen hard from a horse. The majority of historians and several neurological people who have studied head injuries, falls and this accident agree it was a point of marked change. I’m not dismissing anything but there is no evidence of the horse falling on the king or any head injury on this day from any source that can be trusted. How can a neurologist make a ruling on Henry without evidence, without examining his remains? I agree with J J Scarisbrick, there was no dramatic change in his behaviour after January 1536. Ortiz’s account is not backed up by any other source so I feel it is actually reckless to take it as 100% true when it is not corroborated by others. It should not be used to build whole theories on. That’s my point. And I do think that if it was politically sensitive and was hushed up that Ortiz wouldn’t have heard about it and as he did then surely there should be another reference to it. Chapuys seems to have heard nothing of it and I couldn’t find mention of anything untoward in the French sources. I wish we could examine Henry’s remains to know for sure, although I wouldn’t advocate exhumation. In a way, I wish we could explain his monstrous actions with a medical reason. It would be interesting to examine his remains but except for possibly the leg ulcer doing some damage to bone what evidence could there be after 5 centuries?We know his casket was not air tight so I doubt any soft tissue remains still exist. Just a guess I really don’t know. There could be fractures on the skull if he did suffer head injuries in 1524 and/or 1536. What I see is a gradual worsening of his behaviour. He started his reign with two brutal acts, we have Buckingham, Elizabeth Barton, More, Fisher, the Carthusian monks, the treatment of Catherine and Mary, all before 1536. As Stanford Lehmberg points out, Henry’s use of attainders in a new and different way started with the break with Rome. As he faced more challenges he became more and more brutal, and I expect health issues played a part, but I just cannot see 24 January 1536 as a turning point, except that it took him away from his beloved jousting, reminded him of his mortality and made it realise even more that he needed a son. Anyway, to clarify, I’m not saying he definitely didn’t suffer a head injury or brain damage, I’m saying that we should not take 1 source as the absolute truth when no other corroborates it. There’s a theory that he could have suffered from Kell syndrome, it is a pity we cannot exhume Henry as it would be fascinating indeed like a medical mystery tour, his remains were exhumed once and strands of red hair were found to be still attached to his skull, even in death he must have been imposing. Yes, that’s Kyra’s theory. It’s an interesting one. The college of Edinburgh surgeons believes the answer could lie in the genetics passed on by his two great grandmothers, Catherine De Valois and Jaquetta Woodville, iv been meaning to purchase ‘Blood Will Tell’ by Kyra Kramer, it sounds a very interesting read. It’s an excellent read. I’m not sure what I think of the theory but Kyra knows what she’s talking about and argues it well. A very good book. A very detailed study has been done by neurobiological scientists at Yale University, led by Professor Arash Salardini studied the various medical conditions of the King and his personality changes and actions, before and after his accidents and show most of them centre around the neurological pathways in their effect. They have worked extensively with players suffering chronic concussion and have produced several studies in this area. Yes an examination of his skull would help to draw better conclusions as would any DNA work possible but the study of his behaviour and knowledge of his medical history gives us some insight. It is as good a theory as Kell cells or any other blood or genetics. It is as good as bipolar or any madness inherited from his mad French ancestors. None of them can ever be verified, fine theories and as research based as some of them are, because we aren’t looking at an actual autopsy of Henry Viii. Maybe if his stone collapsed but the coffins are not even there, directly below, they are in a specially designed vault to which all of the remains were moved for safe keeping under the chapel. The separation of the remains means they are properly coffined and behind a protective grill, in order, with official records. This was done because Henry’s coffin and that of Jane Seymour were in terrible state. Now they are better looked after. It would be interesting, though, probably the archaeology of the century. I have made a more detailed response below. Just a short reply as I’m not supposed to be on my computer much today! I think we’re talking in circles. I’ve read lots of journal articles on it, seen the TV programme and done lots of research on it. All I’m saying is that we cannot say that Henry VIII was unconscious for two hours on 24th January 1536 or that he suffered a brain injury as a result of it, as only one source, and one outside of England and based on third-hand information at best, states that. We cannot build a theory based on that. We can, however, put forward the idea that a combination of factors, including injuries, came into play on Henry’s behaviour and that he gradually worsened. I personally, along with other historians such as J J Scarisbrick, do not see a dramatic change after January 1536. A switch was not flipped. I think the accident reminded him of his mortality and the need for a son, it frustrated him because he couldn’t joust anymore, and then Anne lost the baby, and those were all factors in Anne’s fall, which I believe he was responsible for. I believe that Henry VIII was awlays brutal. I don’t see him flipping, having a major personality change, I just see him reacting to more and more challenges to his authority, and the break with Rome. The break left him vulnerable and then he also had people defying him and refusing the oath, then rebellion. All challenges to his authority, all needed him to squash them, and so he did. I think you think I’m saying something I’m not. Kyra Kramer’s article on the topic is very interesting, as are her books on Henry VIII’s health and ther theory regarding him having Kell blood type. See http://www.kyrackramer.com/2019/01/24/humpty-dumpty-had-a-great-fall/?fbclid=IwAR2udIs15guiVYGeABQqeZOhKNxw-Eh2cfa8rGCDs1APB5YSReaWVf5DBfM. For me, if I had to pinpoint a turning point in Henry’s behaviour, and I see it as more gradual than there being a sudden change, I would pick 1532/3 and the break with Rome. The Act of Attainder started being used in a new way and you have Elizabeth Barton and her followers, More, Fisher, the Carthusian monks etc. all after that point and before January 1536. Yes, that’s why I have made a long post below, because there are many factors. I don’t believe Henry was always especially brutal, that changed in the 1530s onwards. To be honest I probably wouldn’t have given the accident as a cause and effect change either a few years ago, but modern research does for me personally play a part these days in historical analysis. I have read the Kell cell theory as I have her book and articles but thanks for the link as it is always good to revisit. The problem with Henry Viii is there is another theory every year and they can’t all be right. Personally I think a number of factors combined and Henry is possibly unique in history for many reasons. He wasn’t the only King to break from Rome but he was certainly the one who did it so completely. The King was shown his power by new men like Thomas Cranmer and Cromwell and his reading of Tyndale and probably influenced by Anne because he was shown a way to get his annulment. The works he had collected together to back him up must have been an eye opener. When you see how many of the passages he personally marked you know here is a King who didn’t just accept things but was involved in the formation of those ideas. The Courts had failed so theological arguments were proposed. Henry saw the light bulb and his brain woke up, he could circumvent Rome and do things his own way. That was the spark and he never looked back. Unfortunately, more people disagreed with him and he encountered a greater deal of resistance. I think that also took its toll. The annulment was long and traumatic, a bitter divorce. Katherine said no, the Pope could not and would not decide, the Pope Henry had defended so passionately, everyone was saying no. Nothing was moving and I can see Henry getting desperate. 1531 is the point I believe a visible change begins, the year of his final separation, his move to rule the clergy and his first steps towards being Supreme Head of the Church. By the time he married Anne, after six or seven years of fighting, opposition and wrangling personally I think Henry was fed up. He needed to end the opposition. His new ministers would help him do that in the legislation which followed. The Act of Succession and Act of Supremacy are reinforced with a new Treason Act. People had voiced their opinions before even shouting Get Back to your wife. That was about to change. The religious changes also played a big part and the fact Henry was still looking for a son during his second marriage probably didn’t help either. He was handed one big dollop of power in the Supremacy and those who opposed him were now traitors. The accident pushed him further, because I believe it did cause damage and was partly responsible. He must have felt his mortality. I do see further changes in Henry, though, and sources afterwards say that there were changes. Whether he had a brain injury or one of many or a lot of other factors, the evidence for me points to a sharp decline and health problems and personality changes. I agree we are talking in circles but that’s good because we really don’t know for certain. One theory doesn’t fit all sizes or should I say all Henrys, the accident was a partial factor, but there are many, many more and certainly not an over night swing. I used to think it was trendy just to come up with a theory from medical knowledge to examine or explain the nuts and tyrants of history, but more modern research shows there is something to it. It’s a pity we don’t have more information about this accident, like a medical write up and more information from his doctors. We do know he was hurt more than appeared at the time because later his legs were opened up again and his doctors were treating him, so something wasn’t clear at the time. There is something fishy about this accident. Something is missing. I don’t know why but I always thought something was being covered up. It’s not very scientific, it’s a hunch. Maybe he wasn’t out for two hours but even reading the other reports, there is something not quite right. Maybe no obvious physical hurt but I still believe he hurt his brain. He had other accidents as well and a combination of blows building up is another explanation, coupled with the difficult life experience of a long drawn out divorce/annulment and opposition. We don’t know, but certainly many things are probably coming together and his accident was the final red light. Funny you should mention his feelings of his own mortality as I remember many years ago reading, although I don’t know where but I think it might have been Jasper Ridley, that Henry was feeling his mortality around the time just after the Field of the Cloth of Gold and was concerned about not having a male heir because of some recent life events. This triggered suspicious thoughts about his nobles and the letter to Thomas Wolsey to watch Norfolk, Suffolk and Buckingham. Within a year there was the arrest of Buckingham and his eventual execution, the reasons behind remaining a bit cloudy. Buckingham made an enemy of Wolsey and because of information from one of his household which was probably hearsay he was eventually charged with treason and that meant that he was planning to kill Henry. Whether Henry actually believed this or pounced out of suspicious ruthless fear and temporary paranoia is not clear but Matuskak certainly believed Henry was very insecure within himself and easily influenced into believing the worst in people. He could be a generous friend but he could be too easily influenced against even a friend. That certainly was the case in so many falls during the later 1530s and 1540s, after so many changes in his personal life and public and religious policy. Modern research definitely plays a part but it is wrong to say that Henry VIII suffered frontal lobe damage because he was unconscious for two hours. That is stating something as fact which is not fact. We can say that he might have suffered a brain injury or that he may have suffered repeated brain injuries, but to say something as fact when it isn’t, is very misleading. That is my point. Regardless of a historian or scientist’s views on Henry’s behaviour, it should not be stated that Henry’s horse fell on top of him, that he was unconscious for two hours or that he suffered a brain injury on that day in 1536. It is not corroborated. Hunches are perfectly fine, opinions are fine, theories are fine, but not if stated as fact. Yes, I agree, the source which influences most people now is third hand and we have to be cautious. It is often stated without reference to other sources which say differently as if it’s a given established fact. It should as with many other obscure myths or sources around Henry and his Queens be discussed as part of a wider analysis, with evidence from other research being part of the debate. It’s the dramatic source, which is why it has stuck. If his doctor told him to ‘stop doing/eating so and so or you may die’ would that have been treason to Henry,? It wouldn’t have been very pleasant! When Elizabeth 1st was dying her minister Cecil son of William Cecil told her she must not lie on the floor as she sat unwholesomely, she was reclining on cushions laid on the floor, she rebuked him with the words ‘ little man, must is not a word used to princes’, Henry would no doubt have said much the same. Thank you Claire and Christine. I had not considered fractures or Kells. Both I would think would need only bone evidence. I’m not sure whether you’d be able to find evidence on the skull to support repeated small brain injuries from the brain being rattled, but I’m sure the skull would show evidence of impact, blows etc. I don’t know much about pathology but if there was any bleeding between the brain and skull could there be evidence of healing, even microscopically. Moot point. Yes, I would think so. Now I’m praying for his slab to start sinking or something so that they need to do some work on it! I would love Anne to be exhumed and have a reconstruction done on her skull so we can see what she actually looked like, in fact it would be great if that was done on all Henrys wives but of course that’s going into the realms of fantasy, it’s only possible if a body is found and then it’s considered alright to do that but we cannot have bodies being dug up solely for that purpose, the queen would never allow that either. It would be fascinating to do so but with Anne and the others buried in St. Peter ad Vincula I don’t think it would even be possible. At the end of the work in the 1870’s concrete was poured over the new caskets to shore up the floors and protect the remains. You can find the ebook version of the history of those buried there on Google play for free. I’m with you. I really want to know what Anne looked like. Here’s the title of the book: Notices of the historic persons buried in the chapel of St Peter ad vincula in the Tower of London with an account of the discovery of the supposed remains of Queen Anne Boleyn’. The author is Doyne Courtenay Bell. Even in Victorian times they loved those long titles. Since Lady Jane Grey was never found I’m wondering if the bones thought to be of Anne were of her instead, Jane was described as short and thin rather like her cousin Mary 1st, but then the report said that Dr. Mout assessed the bones to be those of a female around 5 foot 3, which for a female in Tudor times would be considered average, Jane was possibly around 5 foot therefore as she was said to be short so maybe the bones weren’t of her, the bones of Catherine Howard were said to have dissolved in limestone as being young the bones are soft, that could have happened with Jane also, as she was only a teenager when she died, the bones of a more mature woman were found and those assumed to be of Lady Margaret Pole who was nearing seventy, dreadful sad little place is the chapel of St. Peter Ad. Vincula it’s a memorial to those who lost their lives in such a tragic way under tragic circumstances. One of the possibilities I’ve read for no remains of Jane Gray or Catherine Howard was their youth, that pehaps their bones had not completely hardened at the time of their deaths. I don’t know enough about human skeletal development to comment one way or the other. Yes young bones can dissolve a lot quicker, Jane was only around 17 when she died I think and Catherine Howard a bit older maybe 19 or 20, their remains have never been found sadly which proves that they must have dissolved over the centuries in the limestone. Fascinating research! Why do you think, then, that is was the story of Henry being unconscious for 2 hours that has persevered all these 100s of years? Was it because it’s just more dramatic? Hi Mindy. That makes the most sense. We haven’t changed much and I’m sure people over the last 500yrs enjoyed sensational stories as much as we do today. There are a number of excellent articles on here and other research sites on Henry Viii and his apparent change of personality in 1536, but, unfortunately, without examining his body properly most of them remain interesting but unproven theories. We can’t, unfortunately, at the moment, prove any of them. The Kell cell, blood disorder, McCloud Syndrome, are the prevailing popular theories, based on up to date research, but you cannot prove them any more than neurological damage from a serious accident or a series of accidents. However, there have been attempts through virtual autopsy with Robert Hutchinson and a GP to do just that, showing the potential physical results of each of his recorded medical conditions. He had a variety of nasty things, potential killers, malaria and marsh fevers, dangerous and reoccurring, which would have carried off anyone not as robust as Henry was normally. He had more than one physical accident, however, and in 1536 we know the report that he took no hurt is nonsense because he opened up an earlier leg ulcer dating from 1527 or so. He obviously had no visible wound probably because he might well have remained with part of his armour on until he could be examined later on. The ulcer is noted as being opened later, although there is evidence in the sources that his doctors removed or identified, depending on how the text reads as it isn’t that clear, some foreign object or a piece of bone. It isn’t clear if they removed this, but the ulcer was also identified in the sources as opening later on. Henry took the most violent of his encounters with an opponent on horseback in March 1524. We don’t know why Henry failed to lower his visor, but he did, and there is an indication that when the Duke of Suffolk appeared at the ring, Henry wasn’t ready and as Suffolk had slammed his visor and was already at the tilt, Henry suddenly turned, took up his lance and set out, visor open. The crowd became aware and were shouting, the Duke couldn’t hear and couldn’t see the danger, and couldn’t do anything either, most probably and the inevitable happened. The Duke’s lance hit him and splintered inside Henry’s helmet, narrowly missing his forehead and eyes. Suffolk probably wasn’t aiming at his King’s head but the distraction may have disturbed his concentration. Just how Henry escaped without a serious visible injury, without blindness or even death is a miracle and he was very lucky. The poor Duke was more shaken up than Henry and didn’t want to joust again. Henry showed he wasn’t hurt and held no ill will towards his best mate and together they rode another six courses. We think that Henry didn’t escape altogether because he suffered terrible migraines afterwards and was in a lot of pain at times. Another, little known accident came not on horseback, but during a game of tennis, a more precarious and varied game than we have now, called Royal or Real Tennis. It was, just as the top competitions today, a fast and furious game which went on for hours and you had to be fit to endure it. Henry loved it as his building of Real Tennis Courts everywhere attests to. We can see an original Court still in use today at Hampton Court Palace. What is not generally known is just how dangerous this game could be. The ball was as hard as hell to begin with, hit of walls, along ledges, across the net, bouncing of every structure going, hit up to hit a bell and so on. One documentary pointed out that two Kings were killed playing Real Tennis. Henry wrenched his foot in 1527 and he had to wear special slippers and his courtiers did the same in sympathy. While this may be considered a mild injury considering what could happen, it was no doubt a painful one. Another theory which is plausible and probably due to the above was lead poisoning. Henry made up many of his own remedies and they contained some rather strange things but various plasters were applied to his injured legs and many of the materials used contained lead. They also contained other poisonous substances which would have seeped into his bloodstream and into his nervous system. So did Henry have lead poisoning? Yes, it is possible and long term exposure would have affected his brain and added to his pain. Again, we cannot examine this without an autopsy. Whether Henry suffered from physical decline which affected his moods or neurological changes or a rare blood disorder, there is one thing most people will agree, he must have been in a great deal of pain for most of his last decade. The effects of pain are still being discovered today, with research going on all the time. Pain can often be more debilitating than the physical damage itself. For example the damage to both of my knees is traumatic, but it is not as bad as it could have been when I fell down a flight of stairs at University, but the pain, especially when they swell up, leaves me with very little movement at all. Henry had limited mobility after his accident as old injuries are opened up, he put on weight, rapidly, he ate more and he became restricted in his activities. Henry would have probably suffered some of the diseases we now associate with gross obesity, although healthy people can have them as well, but we can’t prove he had them. He was depressed for long periods, clinical depression has a pathological, physical and psychological cause, it isn’t a fit of the blues or feeling down as some people still unfortunately believe today. Apart from soothing herbs and isolation and care, there was little anyone could do for him during these months. There is, however, no record of him ever being treated with mercury and syphilis was dismissed years ago. Henry Viii didn’t have syphilis. Regardless of whether his fall in 1536 was a dramatic change or a nudge towards a more dramatic and dangerous final characters change, which had developed over the proceeding few years, the changes in his personality are remarked upon in a number of sources in a way that simply does not exist before. You don’t need to have one head injury or even one traumatic enough to put you out cold for a couple of hours, for you to become brain damaged. We know from the many studies done on ball players and boxers than continued knocking of the head, even heading a football causes brain trauma and it is one bang one day, maybe harder than before, or more precarious than before which pushes someone over the edge into the personality changes which follow. It is impossible to even diagnose the condition which they suffer with any confirmed certainty until an autopsy is performed. However, neuroscience has developed to the stage that scans show the changes in the brain tissue and chemicals affected, the changes are recognised and the National League accepted the evidence rather than face crippling claims for damages. There is growing concern about our own footballers. One of the most natural thing and the earliest thing you learn to do with a football as you grow is to head the ball. Harmless enough you may think, but if your kids join a football academy, they will be expected to learn all of the skills, effectively and over and over again, for a number of years. If they are good enough, at 17 they may sign a professional contract and then potentially play twice a week or even more, for another 20 years. Believe it or not heading is becoming discouraged but the evidence doesn’t back up calls to restrict it, as yet. We have football boots belonging to Henry Viii, several pairs, used several times. Football was a free for all, but Henry regulated it, although the free for all still happened elsewhere. Nothing is known about the game he played but I would imagine he took more than a few knocks. Finding explanations for Henry Viii or any monarch who displayed extreme violence in their latter years is always going to be controversial. He was far from a tyrant in his early years and even the often referred to execution of Epsom and Dudley wasn’t tyrannical. Henry followed the advice of his Council and investigating people and felt there was enough evidence to try and execute them for extreme extortion, acting outside of their remit, beyond his father’s agenda, for alleged treason, preventing his succession, which probably was manipulated, for a number of other crimes that all held the death penalty. In the end treason was the charge and the trial followed the rules of law. It was a popular, if ruthless move but not one of tyranny. A tyrant would have executed a lot more people facing similar charges. Henry displayed remarkable tolerance during his first decade or so and there are other explanations for his lack of tolerance as time went on, none of them medical. There were four political executions before 1532. These include the baffling ones of Buckingham and Suffolk (Edmund de la Pole) who had a death sentence hanging over him and was executed in 1513 in a move which might be claimed to be in the interests of national security. Henry was off to war and couldn’t leave a rival for the crown around, even under lock and key. If the Scots invaded and London was abandoned, a high profile prisoner needing round the clock watching was taking up valuable resources needed to defend the city. The Tower had been breached before in 1381 and on several minor times. In 1483 two failed attempts to breach the Tower and kidnap/liberate the so called Princes had failed, although there is tentative evidence one may have temporarily succeeded and the Yoemen were meant now to prevent this. However, in a state of crisis how much could they do? The city had come under attack in 1496 and prevailed. However, this was mainly an internal attack. Now Henry was going to war, maybe it simply didn’t seem wise to leave a high profile prisoner in the Tower. In fact, it was often normal practice to empty the Tower if the King went to war or on long term progress. In this regard, Henry’s actions are not that unusual. As I said in my earlier post there are gradually changes in the King’s personality and they are all connected to his experience as a husband and father. He went through a long and traumatic annulment with a woman who was as stubborn as he was and those long years saw him eventually withdraw from the Christian Community he had adored, the Catholic Church represented by Rome and set up his own Church, a new version of the Catholic Church with Henry as it’s Head; he would leave his wife of 24 years for the sassy Anne Boleyn, exile his wife and daughter and turn against long standing friends. His approval of tough new laws to protect his second marriage and future children with Anne, to confirm his new title and the power it brought saw him approve a new and radical Treason Act making those who stood against all this guilty of treason and liable for the death penalty. And yet he hesitated. He didn’t rush to judgement against More and Fisher but took his time over their final prosecution and trials and execution. Was he really still hoping they would change their minds? However, no such hesitation followed the arrests of the monks who opposed him but some of the blame has to be shared with Thomas Cromwell and Thomas Cranmer as they helped Henry to formulate this legislation and achieve his annulment. While they are his servants, there is evidence that Henry was very easily influenced and was insecure as a person. Certainly any suggestions they had would be very warmly welcomed. The difference is that after 1536,_the pace quickened, he killed his wife, something he may not have done otherwise, if the theory that this year changed him, but ironically the pace of violence quickened after Anne’s death. Did even this affect him? It has been suggested by Susanne Lipscomb in her book about 1536 The Year Which Changed Henry Viii. His paranoia was far more evident from now onwards, he was less patient, he had wild mood swings, he was in obvious pain, less and less of the man he had been, outgoing, benign, cheerful, open handed, generous, fun to be around, able to take advice and even honest criticism, popular, and so on, remained. Whether it was one serious bang, for which I believe there is more evidence than not, even if most of it comes later, or a series of bangs and life events, the Henry Viii in the latter decade of his life was a different man to the one who had enthralled the world around him during his previous 30 years on the throne.